Tonight I finally finished sewing all these triangles together! I have been working on this for weeks and weeks now, on Thursday nights at my Mum and Dad's house. It will be a summer quilt for my bed but there is a bit of work still to do. I'm loving how it's turned out so far though. ...delighted to be met at the train station by Talia. I was expecting Mum - she had borrowed my car and was picking me up - but as I stepped onto the platform I saw a little someone standing next to her. When I waved Talia ran and gave me a huge leaping hug, as only a 5 year old can. Mum had been visiting Kim, a family friend, when she had the idea and asked if she could borrow Talia. I'm so glad she did. Talia was so excited to see me which is lovely to experience. We were chattering away in the car together - she's such a cheeky thing. When we returned her home I got to have a snuggle with Toby, her baby brother. He has just started holding his head up when he's in your arms and I was getting the biggest toothless grins. ETA: I have found out from Mum that she wasn't at Kim's when the idea occurred. She actually went to Kim's for the specific purpose of borrowing Talia. I love that Mum had this random idea and she actually did it - all for my enjoyment and surprise. Thanks Mum! ...amused by the outcome of the AFL Grand Final. Or should I say lack of an outcome. For only the third time in the competition's 100+ year history, the Grand Final was a draw and will be played again next week. Unlike most other sports, the AFL doesn't split a draw by extra time or a penalty shoot-out. Nope, they play the entire match over again one week later. When the final siren sounded I think half the city was stunned. The AFL Grand Final is watched by so many people here in Melbourne - it's definitely the most anticipated event on the sporting calendar - that weddings and real estate auctions are planned around it. True fact - the first 5 minutes of half time is the busiest moment of the year for the sewage plant. And now they are doing it all again. ...pleased by Chris' reaction to his birthday present, a set of lego cuff links I found at a market a few months ago. I think he really liked them - his expression was great. Giving more thoughtful gifts was on my list of goals for this year and I think I got it exactly right with that one. And something it never hurts to be reminded of - doing something nice for someone else makes me feel good. ...eaten a lot of Lucy's food, including some of this black forest cake. ...stressed with the planning of my trip. Last night as I was laying in bed I realised I head off overseas in 3 weeks. While interlectually I may have know, it finally sunk in how little time there is left to organise all that needs doing. I still haven't finished hotel reservations! I couldn't resist - after picking up the album from the post office this morning I have begun to assemble my Daily December album! I'm waiting on an order of chipboard pages and transparencies so there isn't a whole lot more I can do until they arrive. Although I am planning on putting numbers on the pages (a leap of faith for me!) I don't even want to do that until I can arrange and rearrange all the pages in the album. I am loving the look of pink and red paired together, so much so that I think that will be the colour scheme on my Christmas tree this year. Pink and red mixed with silver and white. White/cream will also definitely make a big appearance in my album, although it may not look like it from the photos above. I love Molly Irwin's use of white backgrounds with little splashes of colour in her 2009 December Daily and will incorporate that idea too. This is the first time I am attempting a December Daily album and I am incredibly curious to see how these ideas actually translate into a finished album. Wish me luck! Or fine. And I haven't been up to 'nothing much'. This isn't me informing you of some massive problem I'm having. Nope. This is me lodging a protest against automatic, unthinking answers. You know the ones I mean. What have you been up to? Nothing much. Oih! How boring. Those answers are so pointless and absolutely devoid of any personality or information. Sure, often the questions are asked just as automatically - the checkout chick isn't really interested in how your day has been - but that doesn't matter. Say something different anyway! Say you're freezing. Starving. Unbelievable happy. Had a terrible day. Say something outrageous. Something funny. Say anything but ok! You could have just another mundane, everyday encounter. Meaningless. Automatic. Both of you barely paying any attention. The answer just as boring as the question. Or you could make it more. People expect to hear 'ok or 'fine'. That's the answer they got the last twenty times they asked. Surprise them. Share a laugh. You'll both walk away smiling. So the next time you hear me say 'How are you? ', please be anything but 'OK'. Can I Skip the Rest of September Please? Friday didn't go according to plan. As I walked towards the MCG after work I had such a sense of anticipation. My football team, the Geelong Cats, were one game away from the Grand Final and a chance to win their second straight premiership. That anticipation didn't last through the first quarter. We were thoroughly trounced. I actually left at half-time. Don't think I've ever done that before. It crossed my mind that while my team was out there tryingtheir hardest I should stay and cheer them on but the feral-ness of the Collingwood supporters changed my mind. Collingwood is the team that everyone else loves to hate. Their supporters tend to be one-eyed, rabid and everywhere. They'll now go into the Grand Final as clear favourites but I'll be barracking hard for a Saints upset. Baracking and hoping. GO SAINTS! I'll be plagued with obnoxious, overconfident Collingwood supporters this next week, both in the media and in person. It will only get worse if they win. The Grand Final is traditionally held the last Saturday in September so I am incredibly ready for it to be October already. Oh, and to top off a terrible day, I arrived back at my car to discover a parking fine. Yes, I know I did the wrong this but that doesn't make me any happier. Friday's only redeeming element - I've ordered some scrapbooking things to assemble a December Daily album. I'm so excited - I've been thinking about doing one for months already. Acutally, probably ﻿since I decided not to do one last year. It was the right decision but that didn't mean I wasn't envious of all those who participated! December Daily is an album that documents the month of December leading up to Christmas day (and sometimes beyond – that’s completely up to you). It is a chance to reflect, to share, to celebrate the season in a manageable, in-the-moment way. The entire key to this album is to put it together BEFORE December. The Basics: gather up a bunch of holiday supplies, create an album with 25 pages (one for each day), and then when December rolls around you will have a foundation upon which to document you and your family’s story. The idea is to take the time now to set it all up so that on December 1 you are ready to experience + to capture the memories for the day and add them into your album as you go. Ok, time for a bit of a confession: I planned the dates for my upcoming trip with the idea of doing this album in mind! The fact that I am arriving home on the first of December is not a coincidence. (I'm already picturing of photo at the airport or my bags piled on the floor.) I knew I didn't want to be away for December. Yes, I imagine I will take LOADS of photos of my trip and want to do some kind of album with them (although given the current state of my India album whether that will ever be accomplished is another issue) but that wouldn't be a December Daily. I passed on the concept last year and I was definitely not missing my chance this year! ﻿Given the timing, I am aiming to have my album assembled by mid-October. 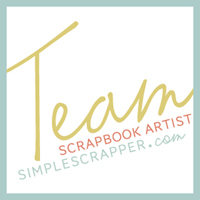 With having to wait for my just purchased products to be shipped internationally (please work quick twopeas and scrapbook.com!) and needing to get ready for my trip, I'm not sure this is achievable. But I'm going to try my hardest. At the very least I would like to have the first week assembled. I have managed to appease my December Daily urges this weekend by working on this layout about looking at Christmas lights from last year. Let me draw your attention to my fantabulous title. Apart from having to work out how to spell the word pilgrimage, it was plain chipboard that I painted, misted and then applied Glossy Accents. This was the third incarnation of 'my kind of'' that finally made me happy. At least! First I tried cream stickers from the left. Then I moved them towards the centre. That left me with gaps on either side that I filled with strips of patterned paper. Changed my mind about that but had stuck the strips with glue that ripped the paper as I removed it. Decided on rub-ons on more black cardstock to cover the rips. Applied the rub-ons but managed to cut the cardstock 2 inches too short, despite measuring. Put down a different strip of cardstock, shortened the rub-on strip and pop-dotted it. Finally happy. How many incarnations was that? I'm just back from climbing (ok, back from the pizza and wine that followed climbing) and I'm on a high! I reached the top of my nemesis climb for the first time. Yay me! In the interests of full disclosure, I will point out that for many people at the climbing gym this wouldn't be a difficult climb. That doesn't matter though - it was difficult for me. I have attempted this particular climb every time I've gone there the last couple of weeks, getting a little further, a little better each time. Tonight I attempted it again as my third climb of the night and through sheer tenacity I got further than ever before. My leg was shaking only a few metres up but I kept going and going, hold after hold. Then, with only about 2 metres to go, my hands just wouldn't grip anymore and I came down. Still I was pleased. My two friends climbed for a while after and just before we left I thought, I'll give that climb another go. And this time I did it, straight to the top! I'm so ridiculously pleased with myself. It's lovely to have that evidence that I am getting better. So, with my nemesis climb conquered, there's nothing left to do but find a new nemesis. That's what it's all about after all - bettering my last attempt. Travel tip: If your plane has a stop somewhere, consider extending the stopover for a few days and having a holiday from your holiday. Ok, I suppose this tip is more relevant to Australia which requires a long flight to go pretty much anywhere, but it's always something worth investigating. Airlines tend to operate out of a 'home' city. You book a flight from city A to city B, chances are the planes going via the airline's home, thereby giving you the chance to get off an explore. I've done this a few times now; heading to Europe I flew Thai Airways and had stopovers in Bangkok both ways, 3 days on the way there and 3 weeks on the way back. For barely any cost (airport taxes) I could travel and explore a different country. Going from Switzerland to Thailand, from snow to beach, it really felt like a holiday from my holiday! Same thing when I went to India, Malaysian Airlines was the cheapest flight, giving me the chance to have a few days in the capital, Kuala Lumpur. It wasn't a place that I had ever thought of going but given the chance - why not? I got to see all this. My favourite building in KL, the Sessions and Magistrates Courts. So many gorgeous arches! The National Monument by Felix de Weldon, creator of the Iwo Jima monument. It commemorates those who died defending the sovereignty of Malaysia and depicts seven soldiers who symbolise the qualities of leadership, unity, strength, vigilance, suffering, courage and sacrifice. I did find the faces a little incongruous though. They don't quite look typically Malaysian to me! The constant sound of construction was one of the first things I noticed in KL. All the development is resulting in an interesting skyline with lots of unusual shapes. And it wouldn't be KL without at least a glimpse of the Petronas Towers. Travel Bug Tuesday: sharing my search for those incredible ‘I can’t believe I’m actually here!’ moments. I'm a creator of lists. Shopping, to do, blog topics - almost anything can warrant one. Getting something onto paper means its out of my head. Writing it down allows me to forget, temporarily at least. Ticking something off provides such a sense of accomplishment. So much so that - I'll admit it - I have been known to write down something already done just so I can tick it off! That's just the first page of things I need to do before I go on holiday! Unfortunately creating the list was the easy part. Now I have to do all those things! Today my housemate Paula made me pancakes for lunch. She felt like them and I totally benefited! I discovered that banana and maple syrup on pancakes are absolutely delicious.I have had the combination at cafes, but somehow the idea of copying that at home had never occured to me before. However, Paula hasn't convinced me to try her combination of banana, maple syrup AND bacon. A few minutes ago I looked at my clotheshorse and realised that it's empty instead of laden with clothes like I left it. While I was at yoga Paula folded them all for me and left them on my bed. The remarkable part of this story is that I have been home for 3 hours, in the same room as the clotheshorse, without noticing a thing. And I've even been into my bedroom, walking past the bed with piles of clothes. Absolutely oblivious! I'm feeling a bit spoilt at the moment. And it's not even my birthday. Thanks Paula! My achievement of the day - I finally finished my Week in the Life Album. Yep, the one that dates back to April. Love the album and love that it's done! More Week in the Life coming soon. Who doesn't like a cake with their name on it?! Journaling reads: A cake with my name on it - love that! Mum surprised me and we had a piece after dinner. I suppose you could call this layout a companion to the last one I shared. While that last layout was about my birthday up to and including dinner, this is entirely about the cake waiting for me when I arrived home. They are very different layouts. That doesn't bother me in the slightest - I like them both. I'm not sure I consider these flattering photos - who looks elegant while eating a slice of cake I ask you? - but I just had to scrapbook them. I think they capture my mood at that moment so perfectly. I thought about using less photos but I'm definitely a multiple photo scrapbooker at heart. I think this sequence tells the story a lot better than any journaling could.